I spent an unexpected week off work watching the 18+ hours of Ken Burns’ Baseball, at first keeping it on in the background to temper the psychological shock of a sudden loss. I requested the DVDs from Toronto Public Library two weeks before, which arrived at my local branch out of order, so I watched them as such – moving from TV and couch cocoon to laptop in bed, its chronology folding in on itself as episodes doubled as distraction and sleep aid, with occasional notes tapped out on my phone in the dark. 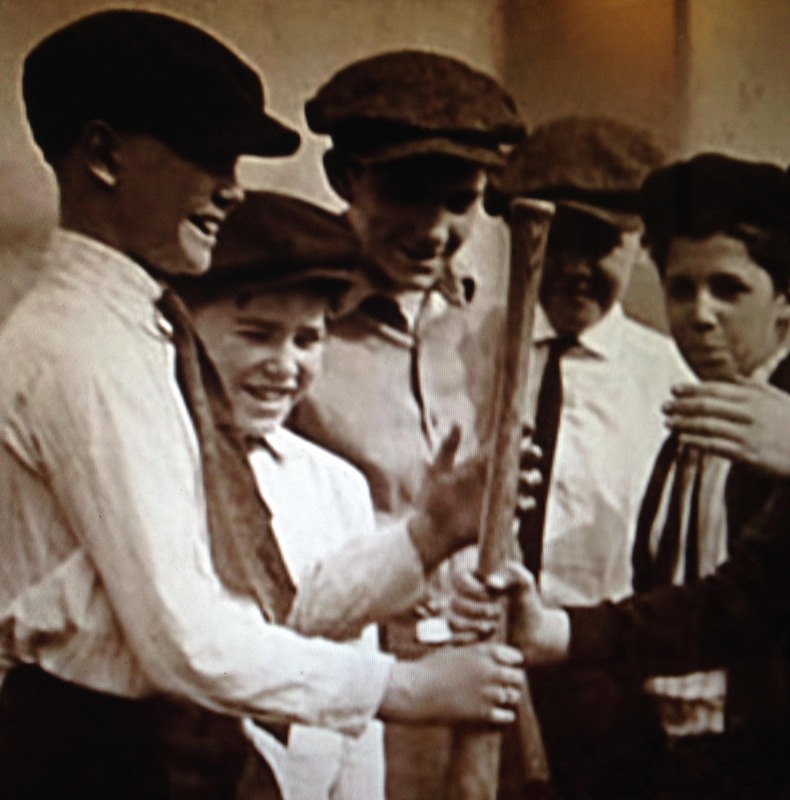 By the time I was able to watch the series in order, I had developed an understanding of Baseball as an archival assemblage, but entirely underestimated its power as a manifestation of American national myth, finding myself periodically moved to tears by its reverent reflections, and with my heart full of longing for the upcoming season. As a documentarian and historian, Ken Burns specializes in such reconstructions and representations of what Benedict Anderson (2006 ) termed the “imagined community” of the United States, having covered jazz, the Civil War, Prohibition, and the National Park System in other eponymous documentary series produced with his team at Florentine Films. “In turning from the theme of the Civil War to that of baseball,” Marc Pachter wrote in The Public Historian, “Burns and his colleagues have turned from the crucible of our national identity to a metaphor for its elaboration” (1995, 145). In Baseball, his second extended documentary series, Burns mines the audiovisual archives of the sport in North America to produce a compelling and coherent tribute to the “national pastime” and its accompanying nostalgia. The narrative history written for Baseball brings together many primary and secondary sources, including newspaper coverage, histories, biographies, and the aforementioned hours of oral histories, to provide a comprehensive and coherent overview of the sport, its broader sociopolitical context, and its linkages to American public memory. The series draws upon a large number of archival collections from libraries, archives, historical societies, individuals, and publications, all of whom are credited in the end credits of each episode (though without naming the collections or fonds themselves). The two archives whose collections figure most prominently across the series are those of the Baseball Hall of Fame and The Sporting News, yet as the narrated quotations and credits demonstrate, an incredible geographic, cultural, and conceptual range of sources and collections were consulted. Newspapers and broadcasts from small towns to big cities, representing independent media and national conglomerates, demonstrate the scope of baseball’s cultural influence. The important inclusion of African-American perspectives (primarily through the Chicago Defender’s sports coverage) provides historical confirmation that the segregation of the major leagues was racist and entirely unnecessary. It is worth noting that despite the incredible amount of material taken from their archives, The Sporting News’ negative opinions on integration are not whitewashed over. Originating in the mid-19th century, the history of baseball in America is nicely coincident with the invention, spread, and ongoing development of audiovisual recording technologies, resulting in a lively visual history of the sport that becomes more dynamic over the course of the series. The initial episodes primarily draw upon still photographs of games and players, frequently panned over and zoomed into to capture the attention of the audience and highlight details (over time, this technique has become a hallmark of Burns’ style, and is now colloquially known as the “Ken Burns effect”). These images are set to a narrated early history of the game, juxtaposed with pertinent quotations from newspapers, players, and politicians read by famous American actors. With the advent of radio and newsreels in the first half of the 20th century, relevant clips provide an increasing proportion of Baseball’s audio and video footage, accompanied by analysis of their role in the expansion of the game’s audience. As some of the key informants reflecting upon their experiences in interviews are broadcasters (including Vin Scully, Red Barber, and Bob Costas), there is some discussion of their roles in the production of the media archive that the film draws upon. Costas tells the story of reporting from the Boston Red Sox’ locker room during Game Six of the 1986 World Series, anticipating a Boston victory over the New York Mets to give them their first World Series title since 1918. In the bottom of the tenth inning, he considered the importance of “the first-ever interview in the wake of a Red Sox championship. There was no radio in 1918…there was no television, obviously.” He prepared to be the one to capture “the first recorded moment after the Red Sox have won a championship”, only for the Sox to blow their lead in an embarrassing string of at-bats, and lose the series to the New York Mets in Game 7. Ken Burns’ and his team’s dedication to historical scholarship is evident throughout the series, and I do not know of a similarly comprehensive and wide-ranging work on the topic, in any medium. Their masterful use of oral history as an expository method deserves particular praise – the extensive time spent interviewing their many subjects is evident when one notes their lack of wardrobe changes over the course of the series, indicating the expansiveness of their conversations. Some feel like confession, or devotion. These testimonies are underscored by the incredible amount of gameplay footage, which visualizes the distinguishing athletic characteristics of the most talented players, drives home the feeling of being a fan in a crowd celebrating the game-winning run, and, over time, helps build up an understanding of why the legends of the game attained hero status. I believe Baseball’s greatest success lies in its ability to translate the history of a sport into a compelling explanation of why it has attained such mythological status as “America’s game”. So much of this is accomplished by showing the audience these heroes, these rituals, these transcendental events named by the film’s experts. My main critique of the film relates to the relative absence of women’s testimonies – over the course of the entire series, only a handful of women spoke to their experiences, as players in an early women’s league, the wife of Jackie Robinson, a poetic historian, and a rare female sportswriter. However, the visual archive employed in the film demonstrates this gendered imbalance with evidence that there have always been female baseball fans, and I imagine that many of us have compelling stories to tell. Perhaps this is a documentary that needs to be made. February is the cruellest month – since my youth, a month of acute grief coincidentally compounded by additional sucker-punch losses over time. I need baseball’s liturgy to get through this – a calendar beginning with this week’s pitchers and catchers report – I need its broadcasts to not feel so alone and its familiar rhythms to calm these heaving sobs and its poetics to inspire me to write my way through this latest loss – there’s a paper on post-9/11 baseball that I should throw myself into now. I need hope in the form of the Blue Jays to replace the hope I need to shed that my companion of ten years will ever return – I need to give that up – but this will be our year. The testimonials of those interviewed in Baseball remind me that I am not alone in possessing such seemingly illogical attachments, but the evidentiary power of the archive unleashed in the series demonstrate how the affective structures surrounding the sport bind individuals, communities, and national identities together. I see us return to the field year after year to escape the pain at our backs, and to rediscover hope. Anderson, Benedict. 2006 . Imagined communities: reflection on the origin and spread of nationalism. London: Verso. Pachter, Marc. 1995. Baseball: a film by Ken Burns (review). The Public Historian 17(4): 144-146. Thelen, David. 1994. The movie maker as historian: conversations with Ken Burns. The Journal of American History 81: 1031-1050.